Any offering from the house of the legendary Jiggs Kalra cannot be ignored. So when Skeeter came to know about Made in Punjab she had plans to go there and sample the grub. After a much delayed visit Made in Punjab fare was finally sampled and how! For starters they’ve done away with the tradition of serving 6-8 kebab pieces on a plate with a little garnish on the side or a bowl of chutney placed in the center. Spectacular presentation followed up by quality food is the USP of Made in Punjab. Spearheading the venture is Zorawar Kalra, son of Jiggs Kalra (who has donned the mentorship cap for the restaurant and the chain). 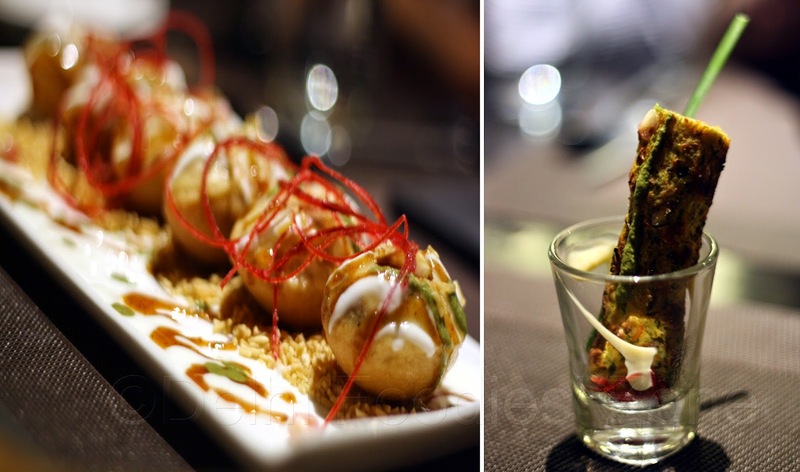 Zorawar thinks big, aims to break and has broken the Mom and Pop shop concept that ruled the Indian dining scene for a long while and is making quick strides in the industry. He knows his game and is good at it. Skeeter started sampling the chef’s Degustation menu with shots of World’s Heaviest Lassi (thank heavens they were just shot glasses). Bursting with flavour, the saffron infused lassi (Rs 220) had bites of heavenly peda in it. Skeety wouldn’t mind being on a repeat mode for this shot. 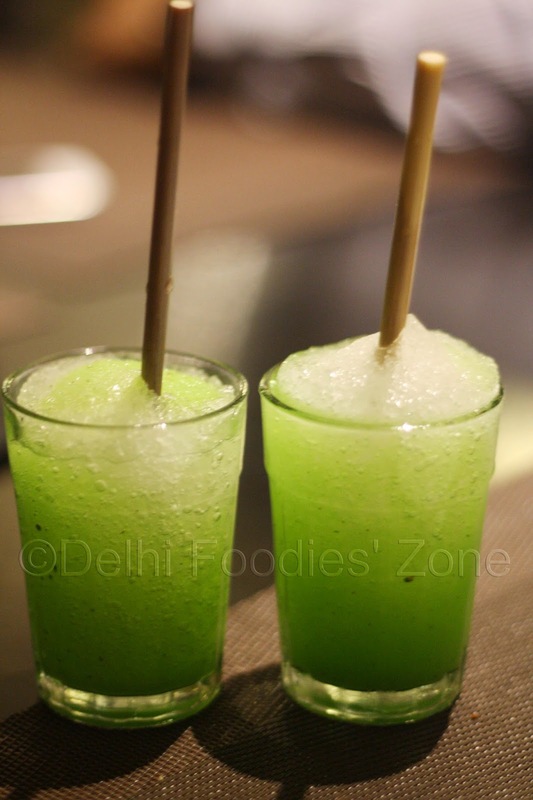 Next came a refreshing bite of the Palak patta chat (Rs 145). A chat with some greens in it: Crispy fried spinach topped with chilled creamy yoghurt, tamarind chutney, pomegranate pearls and a hint of masala. The next arrival, Dahi puchka chat (Rs 145) is again a winner. A sensory delight. The two things that could accentuate this dish to another level would be a spicy chutney or masala and aata puchka as opposed to the suji (semolina) one they used. But understandably, the aata puchkas when filled with yoghurt would have a lesser life. They wilt away way too quickly. 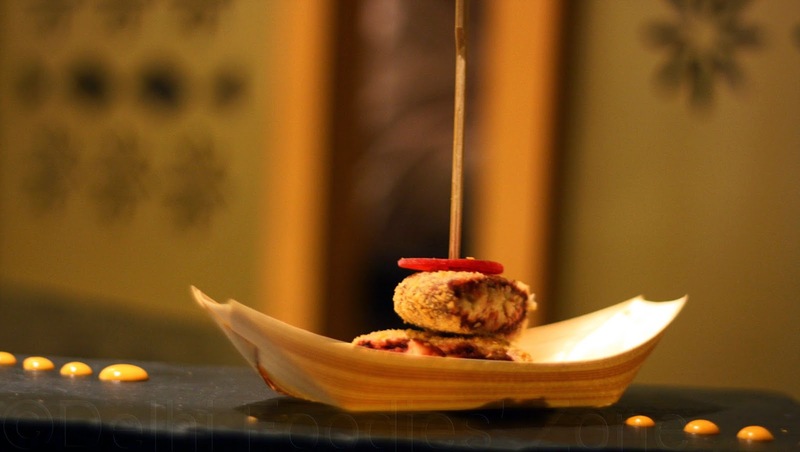 If Skeets had to point out the most pretty dish on the menu, the Beetroot Di Tikki (Rs 315) would take the honour. It came seated in a kishti (boat) with droplets of sauce denoting water on a black slab. Pretty neat! Skeety did not try the Bhatti da paneer (Rs 315) but anyone from the land of Punjab would have fond memories of food cooked in a bhatti or a tandoor. The Tandoori Guchchi (Rs 550) was done well. It came stuffed with cheese. Morels or Guchchi are very close to Skeeter’s heart. You can either make a dish or break a dish using these. 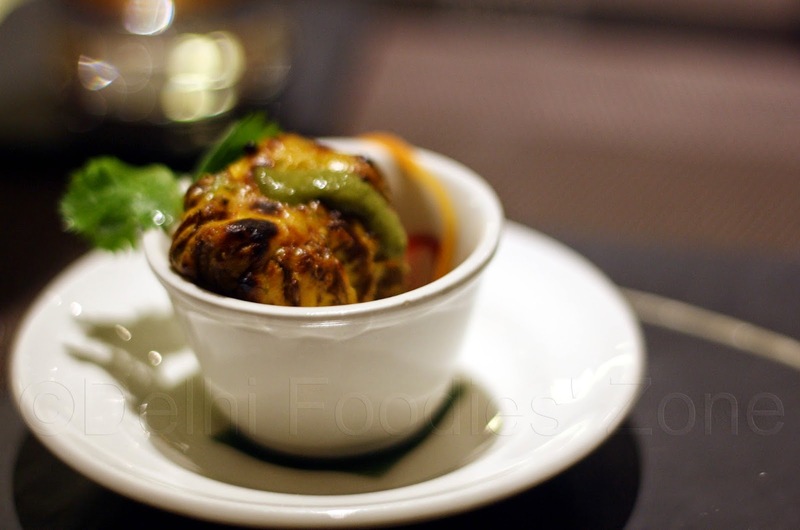 There is NO grey area.This one was a big, fat, flavoursome morel and the paneer enhanced the texture of the dish. Then came a Kiwi chuski or kiwi iced lolly, a palate cleanser to prepare Skeets for the main course. Yummy and refreshing! For the main course there were crispy Mirch Paranthas and Dal Made in Punjab (Rs 315). Both, done to perfection, but what really stole the show was the Guchchi Pulao (Rs 595) and the Burhani Raita (Rs 150). Morels have to be treated well to be appreciated by diners. A great dish this, came in a jar, looked great, and tasted very well. 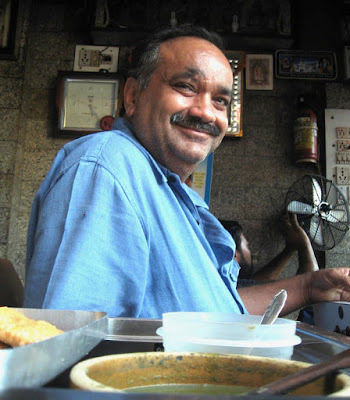 Skeeter would’ve preferred the Morels in the Pulao without the cheese stuffing (a personal choice as Morels have such a robust and earthy flavour that they don’t really need help from other ingredients). The Burhani Raita was a stunner. Skeeter is a self-confessed garlic fan and makes Burhani raita at home quite often. There are two ways you can do it: raw or fried. Made in Punjab fried some garlic flakes and tossed them into creamy yoghurt. The Burhani raita married the flavours of the Guchchi Pulao pretty darn well. 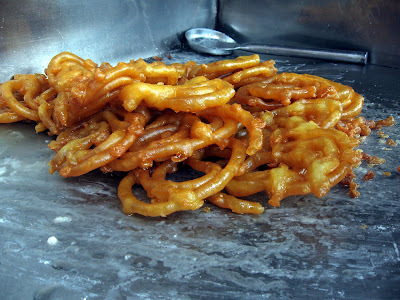 Dessert was Crispy jalebis with rabri (Rs 225). 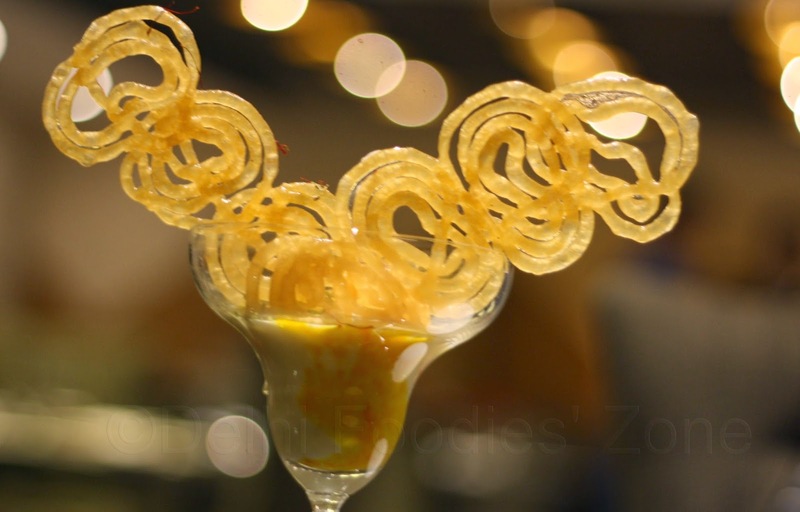 Crispy jalebis planted in a glass filled with rabri were a delicious end to the meal. Just the right amount of sweetness (unlike the overtly sweet that we are used to) and crisp to perfection. P.S. : Skeeter was invited to review Made in Punjab. Thanks Zorawar, Sonali, Varun and MIP team for a memorable afternoon and great food.